Large diameter hose is no longer the sole property of industrial firefighters. 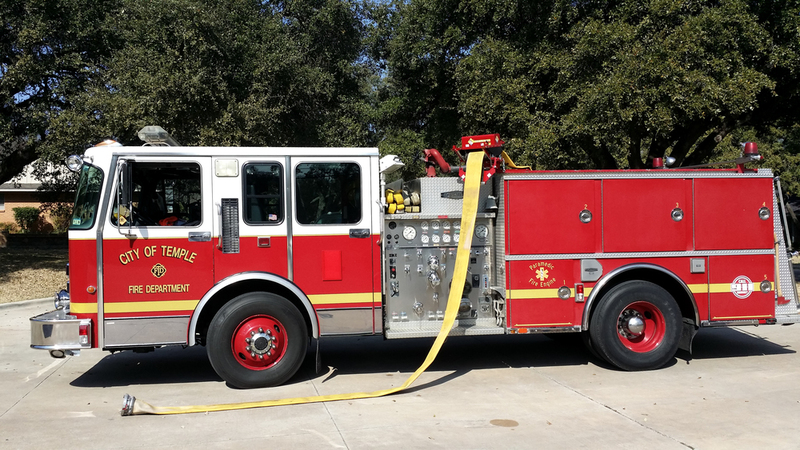 Across the country, many rural fire departments have adopted five-inch hose or larger as the ideal sized supply hose, providing a virtual above ground water main. 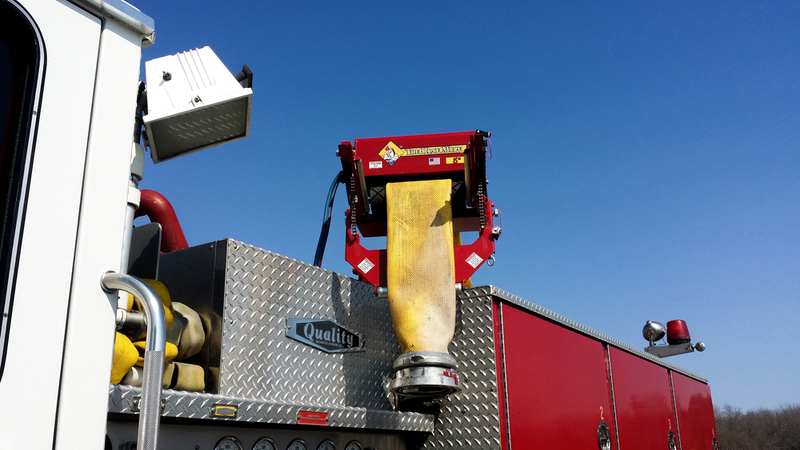 The problem comes when it's time to put the portable water main away, says Clint Baker, a firefighter and inventor of the Hose Mule, a device for loading hose aboard the apparatus. "The five-inch hose is about the most efficient way to move water, but nobody wants to pick up a half mile of five-inch hose," he said. "I started thinking about whether there was some way to mechanically pick it up." After eight years of tinkering, Baker has a product ready to market. The Hose Mule mounts on the side of the fire truck above the hose bed. It comes equipped with rollers that grip the hose, both lifting it and simultaneously draining the water and air inside. "As you drive along side the supply line you had laid, the Hose Mule picks it up and brings it back into the truck bed where all the crew has to do is fold it back into place," Baker said. "A crew of four can pick up 100 feet of five-inch supply hose in a minute." The Hose Mule comes in two different models - one that runs off a 12-volt DC gear motor and the other that operates hydraulically. The hydraulic model, known as the Super Mule, is designed to handle hose six inches in diameter and larger, common among industrial fire brigades. "The hydraulic machine has a flow control valve on it where you can vary the speed," Baker said. "The electric one is a set speed, but you can vary the speed by how much down pressure you put on the drive roller." Baker has already made his first sale of the hydraulic Super Mule. Paul Shapiro, a retired Las Vegas Fire Department firefighter and author of "Layin' the Big Lines," purchased a Super Mule to mount on a water supply engine. Shapiro plans to contract with wildland fire suppression agencies in western states for water supply. The closest competitors to the Hose Mule are huge machines by comparison and cannot be retrofitted on a normal pumper, he said. Baker, a Temple, TX, firefighter for 11 years, has already sold machines to his own department as well as nearby Lorena, Robinson, Beverly Hills, Hewitt and Fort Hood. "In Temple, we mounted the machine on the engine that I drive," Baker said. "We were waiting on the city garage to wire it into the electrical system when we had a big mutual aid call involving a factory in Belton. The engine ended up laying its whole bed." Without the Hose Mule working, the only recourse was to reload the hose the old fashioned way - by hand. No one was happy with the results compared to what the Hose Mule could do, Baker said. "When they came back to Temple, we took the truck over to the convention center and laid all the hose out again," he said. "Using a temporary hookup, the Hose Mule was able to pick up the entire 1,300 feet of hose in only 18 minutes." With the air and water completely drained, the load in the hose bed dropped at least eight to 10 inches, Baker said. The benefit that most impresses fire chiefs is that the Hose Mule lowers the potential for back injuries in loading hose, he said. "If it prevented one back injury, you could probably buy one of these machines for every truck in your department," Baker said. Initially, Baker built the Hose Mule himself. Demand has been such that to continue his career in fire fighting, Baker had to outsource the manufacture of the device to a local machinist. "The product is a good machine," Baker said. "It obviously works."